I came across a very interesting bit of news today. 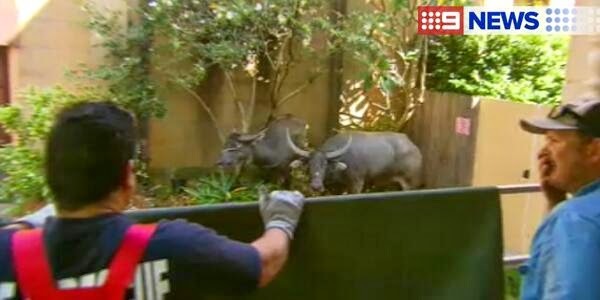 It appears that the residents of an inner-Sydney suburb in Australia were quite shocked and startled Yesterday morning, to see two water buffaloes racing down the city streets over a distance of about 2 Km. The pedestrians, disbelieving, what they were seeing, just stood still, while car drivers scurried to get out of the way. Reuters reports that the two buffaloes looked agitated, having escaped from a city park, where an advertisement was being filmed, in which they were supposed to play a role. Firefighters rushed to the scene and finally rounded the animals using ladders and firefighting gear to corral the animals into a makeshift pen, while live tweeting the operation. The operation was over when at the end handlers from the film set took the animals away. This news immediately connected my mind to some of my childhood memories, when such encounters with buffaloes used to be extremely common. The first incidence that came to my mind was, when my father was badly injured in an encounter with a band of buffaloes. My father had a 250 CC AJS make motorbike, on which he used go around the city. Once, when he was riding back to the house with my mother on the pillion seat, he saw a large herd of shining black buffaloes further on the road. They perhaps had just finished their bath in the river and were returning to their pen happily. 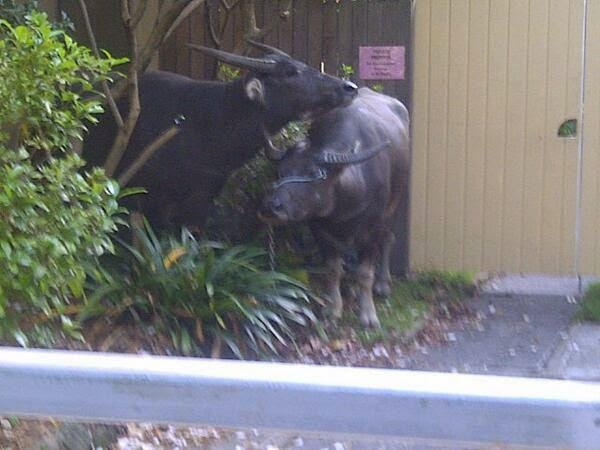 Normally, water Buffaloes are very docile animals and just continue on their way silently. That day however, they were not in such happy state of mind and there was some sort commotion with the result that the herd suddenly changed gear from slow walk to a canter. My parents were absolutely dumbfounded and scared as these huge beasts ran ahead barely brushing past them. Mean while, as the confusion reigned supreme, one highly agitated buffalo hit the handlebar of the motorbike and my father and mother both fell down. Luckily the cow (or buffalo) boy arrived at the spot and managed to retrieve the situation with my father getting heavy bruises. Luckily my mother escaped unhurt. Water Buffalo is always considered as almost the ultimate standard of laziness and stupidity for no plausible reason. Buffalo milk and products made from milk, form a significant portion of our daily diet. Yet the source from where we get this earthly elixir, or a water buffalo, is often scorned, slighted and often taunted. In Indian villages or even in towns, a herd of Buffalos quietly crossing a road or walking along it, is a very common sight. In the first few years, after I had started my business, I used to move around on my Lambretta scooter in the small by lanes of Pune city, where most of my suppliers were located. I can still remember one narrow patch of road, where I used to encounter regularly, herds of even 100 buffaloes. This patch of road was very near the river and the owners took their Buffaloes for a wash through here. Those days, there were many buffalo pens within the city itself and the pen owners very casually drove their herds on the streets, without bothering at all about the traffic. On one day, I encountered one such herd on the narrowest part of this street. I had no choice but to park my scooter on one side of the street as scores of black beasts, their freshly washed black skins shining in the late morning sun brushed past me. It must have taken that entire herd about 5 minutes to pass me. However for me, those harrowing 5 minutes had turned into hours. 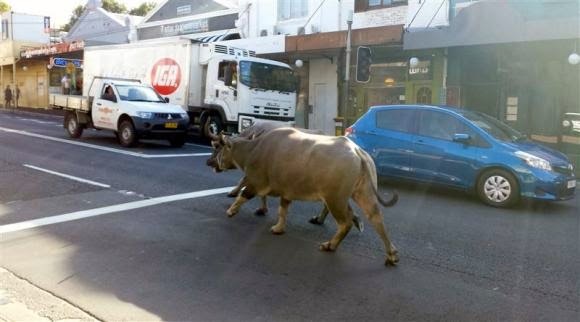 In the later years though, the local Government decided to shift all buffalo pens from the city to outside of the city limits and this most weird kind of street menace, disappeared from the Pune city streets forever. My worst encounter with a buffalo happened long time ago. I had gone some place with a grandmother of mine. My grandma wanted to go to a temple and asked me to come along. As we were walking along, we saw one huge black beast suspiciously looking at us. My grandmother was scared and told me that we should quickly move to the side and keep quiet. I however did not agree and continued walking with much bravado. Withing next few seconds, this beast suddenly charged towards me and before I knew what was happening, I found myself lifted in air at least a couple of feet. My grandmother shouted and some bystanders ran for help. Luckily for me the beast just dropped me back on ground and disappeared. I was just plain lucky that day or otherwise I would have found myself lying on roadside with few bones broken. Ever since that day, though I very much cherish my glass of milk, I studiously avoid any kind of contact with buffaloes of any type or kind. It is said that it would be hard to find another four legged creature, as dovish or pacifist as a buffalo. In south east Asia, water Buffaloes are used even for ploughing fields and for pulling carts. Yet, whatever people may say, most of us feel scared, when we come across a herd. I am no exception.